Responsiveness is one of the most valuable features of any app. This is even more important in resource-constrained devices like smartphones. Users must be able to interact with the app in a smooth way without falling into flickering or a slow UI. For these reasons, concurrent programming must now be a part of the skillset of every developer. It’s very important to know that all the interactions with UI components in an Android app happen on a single thread that we call the main thread — or, simply, the UI thread. Experience in other environments (Swing, AWT and others) teaches that the best approach is the one that translates every operation on the UI into a message to a single consumer that runs on the main thread. In Android, you can do this in many ways using different tools. HandlerThread is one of these. Prerequisite: This tutorial assumes you are already familiar with the basics of Android development. If you are completely new to Android development, read through our Beginner Android Series. Other prerequisites include basic knowledge of threads and multi-threading. As a first step, download the materials for this tutorial by clicking the Download materials button at the top or bottom of the tutorial. Once you’ve downloaded the materials, open the starter project in Android Studio 3.1.3 or later and get familiar with its content. FoodAdapter: An adapter class for the RecyclerView of different food orders containing the order’s name, price in INR and the side order. FoodOrder: A model class for ordered food with three variables: foodName, foodPrice and sideOrder. FoodRunnable: A Runnable implementation, which will allow the creation of orders to send to a background thread, which will do the processing operations. MainActivity: An Activity where you have live updating food orders with their respective details. This isn’t what you want. The UI should display the new orders as soon as our hungry customers create them. You need to manage orders in the background and display them in the list. This is a typical problem that HandlerThread can solve. But before implementing this, you’ll dive into the theory of HandlerThread. 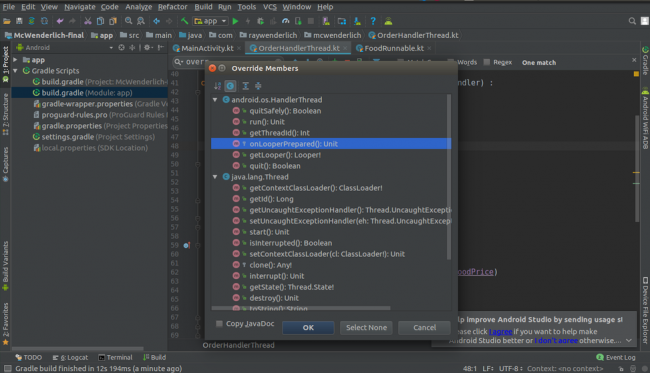 In Android, the HaMeR framework allows for interaction between any pair of threads, which can be any background thread and the main thread. In order to avoid race conditions and deadlocks, a thread can execute operations simply reading messages from a queue and executing them in sequence. When thread A wants to interact with thread B, thread A puts a message into the related queue. This can be done using a Handler object. Handler: This is the most important object of the framework because of its double responsibility. It’s bound to a specific Looper for a given thread, and it provides the methods for sending messages to the related MessageQueue. The Handler is also responsible for the actual execution of the Message content. Message: Encapsulates the information about the operation you want to execute on a specific thread. Runnable: Interface that abstracts any operation that a thread can execute. MessageQueue: As the name suggests, this represents the queue of messages that a thread consumes. Looper: This is the object responsible for the loop that checks the MessageQueue to see if there is message to run and send it to a specific Handler. Every thread can have only one Looper. But what’s the role of the HandlerThread class in all of this? As you’ll soon see, it’s a class that simplifies the creation of a Looper and related Handler instances in the case of background threads. Now, time to start writing code! 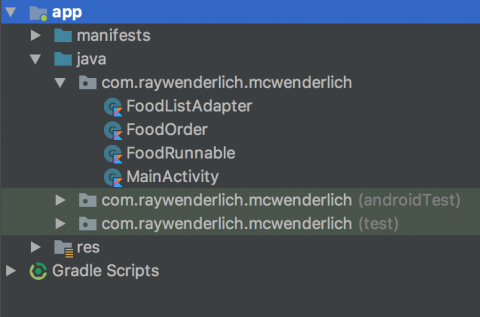 In Android Studio, right-click on the com.raywenderlich.mcwenderlich root package folder and select New ▸ Kotlin File/Class. Next, name it OrderHandlerThread and select Class for Kind. Make it extend HandlerThread. * Converts the food price from USD to Indian Rupees (INR). * 1 USD has been considered as equal to 68.45 INR. * @foodPriceInDollars price of the food in USD. * Attaches random side order to the incoming food orders. getHandler prepares the Handler object bound to the corresponding OrderHandlerThread, which you will use to perform the actual operations of converting the currency and attaching a side order to the upcoming foodOrder. sendOrder gets the corresponding foodOrder and passes it to the Handler for operations. onLooperPrepared helps to setup the handler with a looper. Creates and returns a Handler object and passes the Looper through as its parameter. The Handler overrides a method called handleMessage(), where you can handle the upcoming orders or simply the Message, process them and then send them back to the UiHandler for updating the UI. You obtain the upcoming order from the Handler. Now, it’s time to process the upcoming orders. In this line, you simply call the convertCurrency() method to get the corresponding price of food in INR. Next, you attach the additional orders to the foodOrder. You simply call the attachSideOrder() method to provide a random sideOrder with the food. After processing the foodOrder, you are ready to send it back to the UI. In this line, you create a Message to wrap the processed order. Here, you put the processed foodOrder in the object of type Message. 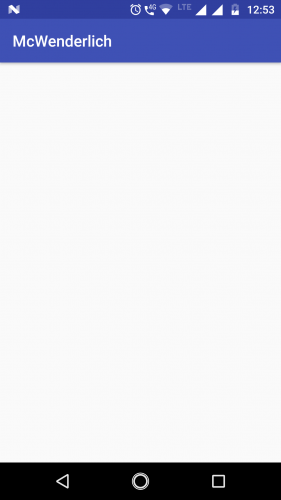 Now, you finally send the processedMessage to the UIHandler by calling sendMessage() on its instance. This method will pass the processed messages to the UI and will, in turn, handle those messages by updating it. Here, you create a new object of Message. You wrap the food order to the Message instance, which you created in previous step. Now, as your message object is ready, you will send this object to handler with the sendMessage() method of Handler. Next, override the onLooperPrepared() method in OrderHandlerThread. This callback is invoked before the Looper of OrderHandlerThread starts looping the messages. You will use this callback to set up the handler that you prepared previously through getHandler(). In this method, the looper of the OrderHandlerThread is ready to be passed to your handler. You initialize the handler with the getHandler() method created above. Finally, you have completed setting up by creating your HandlerThread. Now, it’s time to manage the Runnable instances and update the UI. In the FoodRunnable class, you will complete two things: adding the method setMaxOrders() and also the code in the run() method of the Runnable. The setMaxOrders() method will create the orders of certain sizes, passed as parameters. The above assigns the number of orders created from MainActivity. The thread will run until the counter count is equal to the size of orders required. You get a random food name from the method getRandomOrderName(). The method is already declared in the FoodRunnable class. You get a random value of price for the order from the method getRandomPrice(), which is already declared in the FoodRunnable class. You then pass the model to the sendOrder() method of the orderHandlerThread object. You put a delay of one second by calling Thread.sleep() so that you can see the changes in the UI when new items are added to the RecyclerView. You have completed managing your Runnable to register, send and create your orders. Next, you will update the UI of MainActivity. Tighten your seatbelt! Open MainActivity in the com.raywenderlich.mcwenderlich package. You will observe that the RecyclerView methods and the adapter are already set up for you in onCreate(). The code of the UI handler has also been set up for you. This UiHandler is bound to the UI of the Activity and, thus, can be used to change the UI. Note: This is done to ensure that UI changes are done from the UI (i.e., main) thread. Changing UI from a separate worker thread could produce an ANR (Application not Responding) dialog. You initialize the orderHandlerThread and pass the uiHandler as parameter. You start the orderHandlerThread by using the start() method. You initialize the FoodRunnable, passing the instance orderHandlerThread. Finally, you invoke the setMaxOrders() method passing 10 as the size of the orders, and you then start the Runnable. Note: Here, it’s important to recognize that you are using the WeakReference class for operating on the foodOrder instances. This is to ensure that these views are garbage collected successfully and don’t cause any type of memory leaks. You get the current size of the orders from the weak reference of the adapter. In the function addAndNotifyForOrder(), you add the new upcoming order from the OrderHandlerThread and notify the adapter of adding the new item at the position. You smoothly scroll to the current position of the list where orders have been added. The above code stops the foodRunnable and the orderHandlerThread by calling stop() and quit() respectively on their instances. And that’s all you need to assemble for your HandlerThread! Here’s a quick recap of what happens throughout the entire app. The MainActivity creates 10 orders through the FoodRunnable. The OrderHandlerThread receives the orders, converts their prices from USD to INR, and attaches the additional side orders to them. Finally, OrderHandlerThread forwards the processed orders back to the UI through the UiHandler, which is bound to the UI of the app. This UiHandler updates the item list in the FoodListAdapter and then notifies the RecyclerView adapter. They are useful when you need to implement a Producer/Consumer paradigm between different threads. It simplifies the creation of the Looper instance that is bound to a specific thread. It is used in the Android Service implementation in order to execute some tasks off of the main thread. AsyncTask: This is a Facade that simplifies the usage of the HaMeR framework components when you have to run simple tasks in the background and produce a result to be displayed in the UI. Service: Activities are not a good place for threads because they can be killed by the system if it needs resources. On the other hand, Services are components that Android preserves with higher priority and are a better place for a thread to run. Because Service run on the main thread, a HandlerThread is often a good solution. IntentService: This is a Service implementation that creates a HandlerThread in order to run tasks sequentially. This is useful if you need to run tasks using the fire-and-forget paradigm. Note: It’s important to recognize here that IntentService uses HandlerThread internally. You can look at the source code here. What HandlerThread is and its role in the HaMeR architecture. How to create your own HandlerThread implementation. How to manage UI changes from a background thread. Differences between HandlerThread and other classes like AsyncTask, Service and IntentService. You can download the final project by using the Download materials button at the top or bottom of this tutorial. If you want to learn more about HandlerThread, look into the Android Documentation. You can also learn more about concurrency on Android by checking out our Android Background Processing video course. I hope you enjoyed this tutorial on HandlerThread. Join us in the forums to discuss this tutorial and your findings as you work with HandlerThread!